1 Taiwanese speedskater Sung Ching-yang warms up prior to the start of the men's 1000-meter speedskating race at the Adler Arena Skating Center, Sochi, Russia, Feb. 12, 2014. 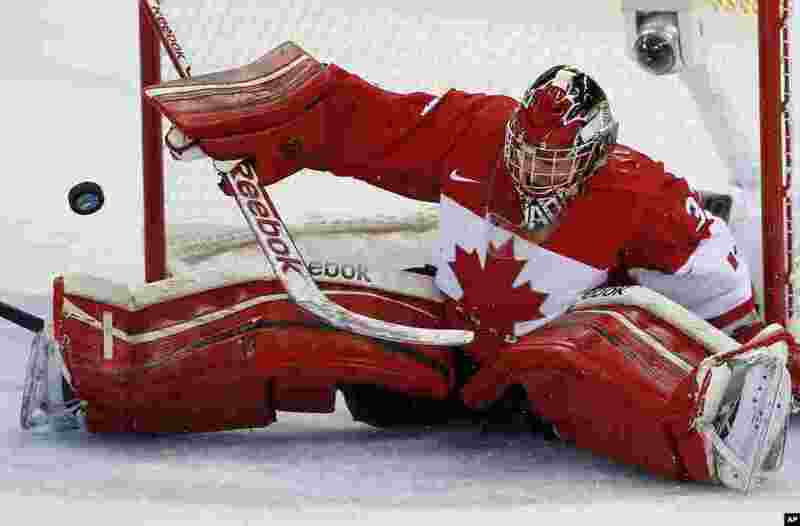 2 Goalkeeper Charline Labonte of Canada bats the puck away during the women's ice hockey game against the United States at Shayba Arena, Sochi, Russia, Feb. 12, 2014. 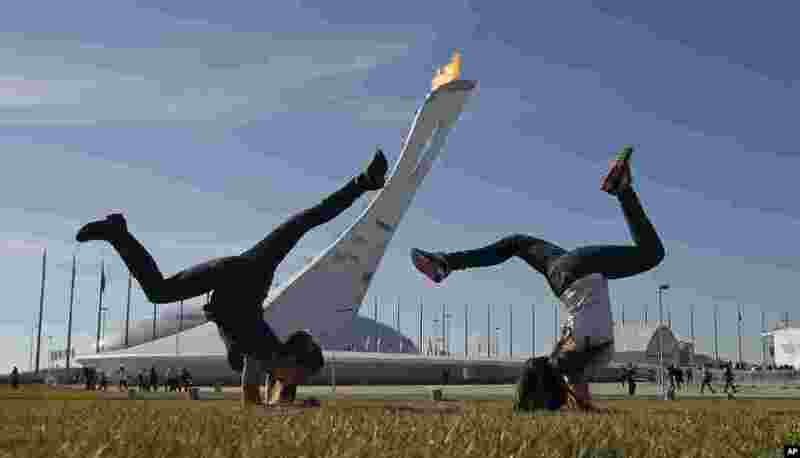 3 Young girls play on a warm day in the Olympic Plaza, Sochi, Russia, Feb. 12, 2014. 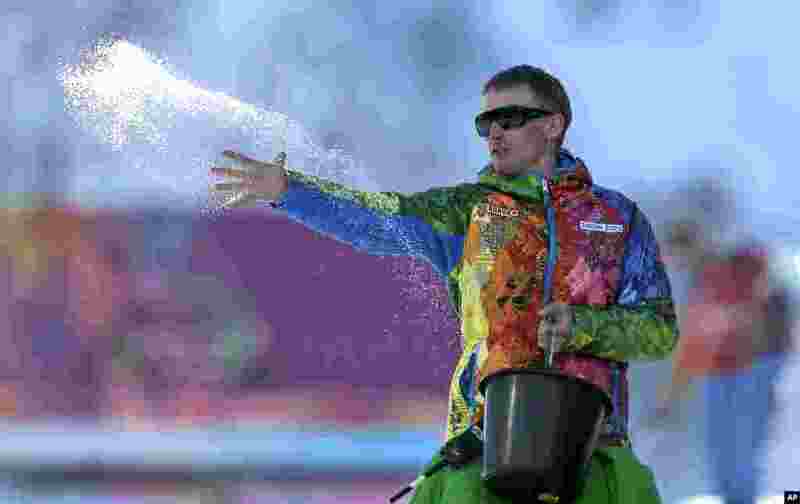 4 A worker throws salt during the women's snowboard halfpipe at the Rosa Khutor Extreme Park, Krasnaya Polyana, Russia, Feb. 12, 2014. 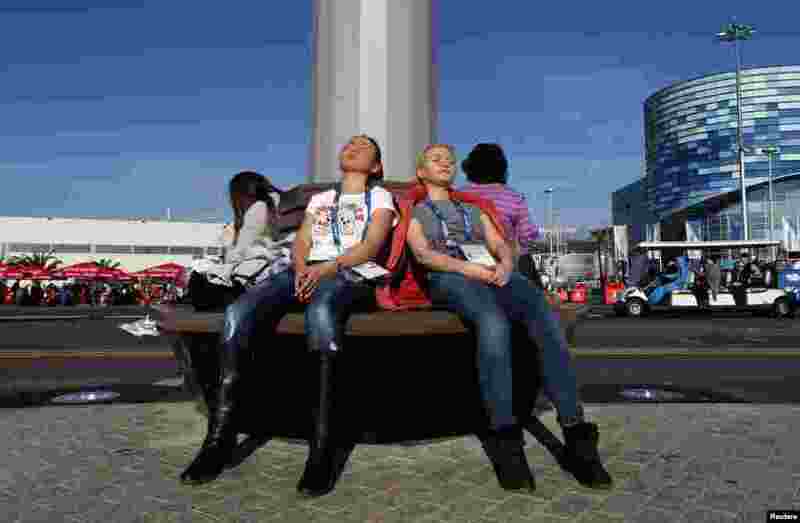 5 Women sun themselves in 60-degree weather at the Olympic Park, Sochi, Russia, Feb. 12, 2014. 6 A man walks out of the Black Sea with the Olympic Park seen in the background, Sochi, Russia, Feb. 12, 2014. 7 Australia's Holly Crawford competes in the women's snowboard half pipe at the Rosa Khutor Extreme Park, in Krasnaya Polyana, Feb. 12, 2014. 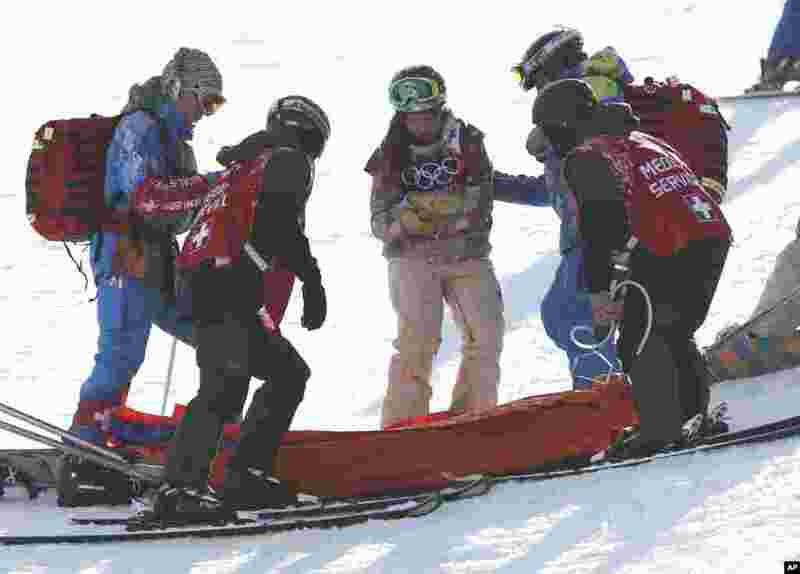 8 United States' Arielle Gold is assisted after injuring her hand in a crash during the women's snowboard halfpipe warm-up, Feb. 12, 2014, in Krasnaya Polyana, Russia. 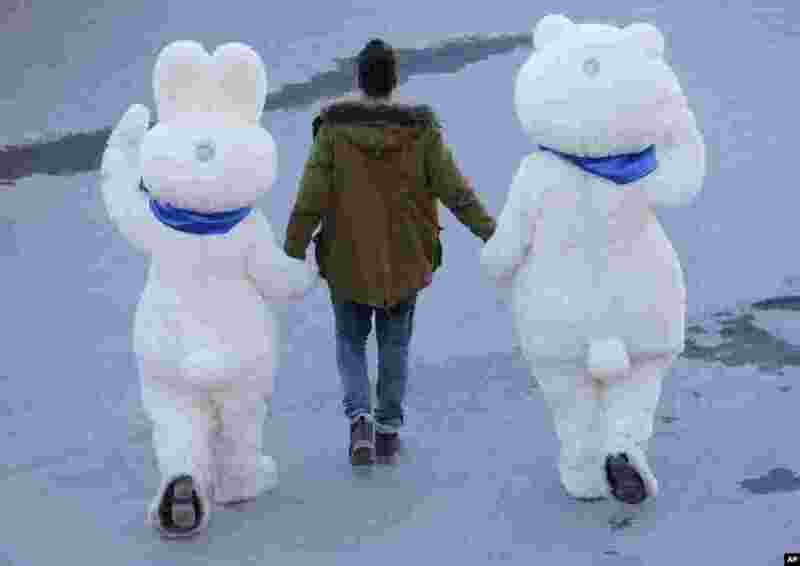 9 A man leads the Olympic mascots to the cross-country portion of the Nordic combined, Krasnaya Polyana, Russia, Feb. 12, 2014. 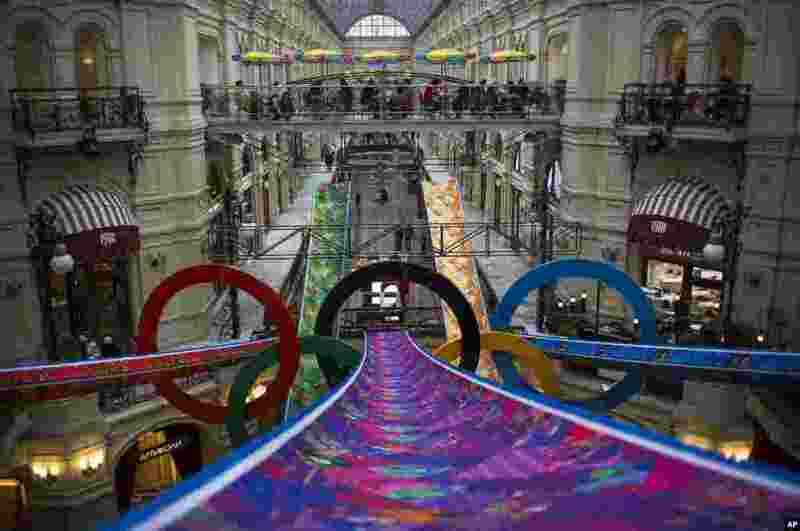 10 Visitors walk inside the GUM department store decorated with Olympic rings in Moscow, Russia, Feb. 12, 2014.